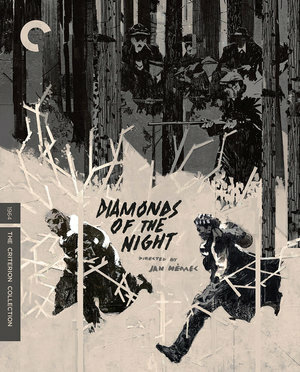 Diamonds of the Night (Démanty noci) announced itself in 1964 as what it remains: a key early film of Czechoslovakia's New Wave and a hard, shiny, multi-faceted gem that flashes in the mind without giving away its essential secrets -- and that's part of its secret. It's not only possible for audiences to emerge from this movie without a clear idea of what happens in it, it's virtually required. We're left with existential terror. That's a remarkable feat in general and especially so with a film that apparently has a happy ending. A 2018 restoration is now available on Blu-ray from Criterion. In attempting to convey what we glean from this remarkable package, it's impossible not to discuss what happens in the film, so consider this a SPOILER alert even though, in one sense, it's impossible for such an almost avant-garde approach to narrative spoil anything. The story is simply that two young men, more or less boys, escape from a transport train of concentration camp prisoners somewhere in Germany. They run through the woods, get caught by a cadre of old men, and apparently are released or escape again into the woods in an eternal cycle -- unless they're shot. Director Jan Němec co-scripted the film with author Arnošt Lustig. They were adapting the latter's 1958 autobiographical story of the same name, also known as Darkness Casts No Shadow, which is inspired by the author's actual escape from such a situation. Therefore, it's a happy ending, right? 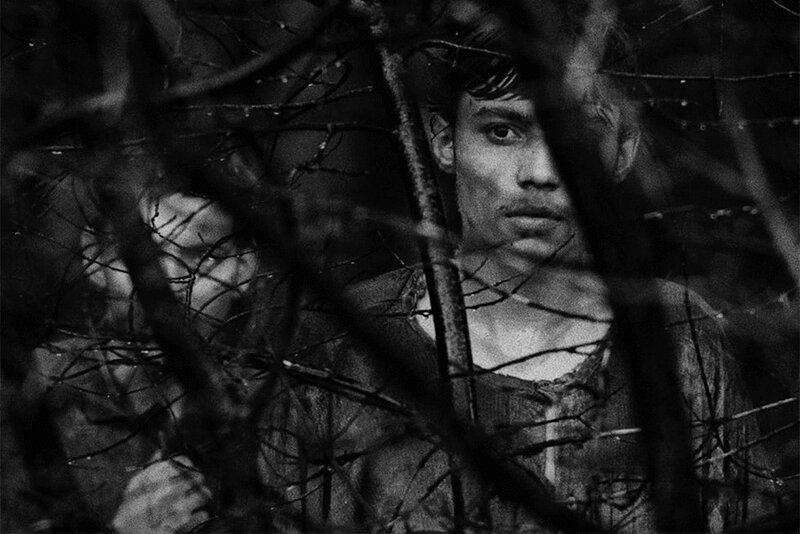 The trouble and glory with Němec is that he's interested in fragmentary, fractional, refracted and refractory narrative, based partly on his reading of William Faulkner and partly on his youthful excitement at the discovery of dream-and-memory in the films of Alain Resnais. In a bonus interview, he discusses how such decadent bourgeois films, officially banned in Czechoslovakia, were screened for students at FAMU (Academy of Performing Arts, Prague). He also mentions that he preferred Faulkner because Hemingway was too "crowd-pleasing" and that he finds Faulkner hard to understand; this gives insight into youthful pretension, for hipster scorn remains with us today, but it's also a specific reaction to growing up in a highly regulated society where officially approved things served a propagandistic agenda. Němec also responded to the meticulous, stripped-down, emotionless observational approach of Robert Bresson's A Man Escaped (1956), one of the most non-melodramatic suspense thrillers ever made. (Another is Jacques Becker's 1960 film Le Trou, indebted to Bresson.) In another bonus, critic James Quandt discusses these and other influences, from those in your face -- Luis Buñuel and Salvador Dali's Un Chien Andalou (1929) with its ants crawling on a man's hand -- to the more subtle, like Andrei Tarkovsky's Ivan's Childhood (1962), which Quandt observes would make a good double feature with Němec's film. How does Němec apply his ideas and influences to Lustig's seemingly straightforward story? After the opening credits alternate silence with distant passages of church bells, the drama opens with a literally breathless long take as our two young figures are captured in the act of running and climbing against a backdrop of distant shots and cries to halt. The camera is running along beside them on a long, specially constructed track up the hill. It's not entirely one take but appears to be very subtly cut together from two or three (they shot it four times over four days), yet the effect is of one endless run in one endless shot. It will be a solid 15-minutes before the first line of dialogue is spoken, and the unnamed boys never carry on a real dialogue. Their existential status as "babes in the woods" functions both literally and abstractly in a situation infinitely more desperate and menaced than that of Vladimir and Estragon in Samuel Beckett's Waiting for Godot (1953), though we're reminded of it. The basic materialism of the story is never allowed to dominate, for the smaller boy, the "talky" one who says maybe 100 words in the movie, allows his mind to drift to flashbacks and fantasies with the soundtrack of one reality dubbed over another. Things remind him of other things. Sometimes these memories are concrete and directly relevant to their situation, like the shoe he switched with the other boy, and sometimes more distant. Sometimes the reality of these memories is unclear. Could it really be that the boys wandered freely through the Prague streets with coats whose large "KL" on the back declared them inmates? Are fantasies mixed up with real memories? Other moments are clearly fantasy, as when the smaller boy (is that why we think he's younger?) imagines multiple outcomes to his encounter with a farm woman, including three repetitions of striking her on the head with a stick -- an image mixed up simultaneously with her sexual allure. At a certain point we must wonder how much of what we see in the woods is reality. Is this all an allusion to Ambrose Bierce's 1890 story, "An Occurrence at Owl Creek Bridge", hallucinated in the mind of a dying man? The last part of the story involves being hunted and captured by a group of old, even ancient-seeming German men, who practically totter and dodder in their determination to hunt down the youth of the day. They stage a celebratory meal, complete with music and song, that foreshadows Němec's next feature, A Report on the Party and the Guests (1966) and his friend Miloš Forman's The Firemen's Ball (1967). For that matter, feasts that go awry recur in Czechoslovakian films of the '60s. One brief exchange seems to have the smaller boy lying through his teeth in an attempt to convince some official behind a desk that he's really a Czech soldier or civilian, leading the man to make some reference to a court martial. The boys make plans to escape from the second transport train, or has it all been one transport train? Are the old men playing with them in staging a firing squad, and do the boys really escape again into the woods? Will they always be in the woods? Was one form of totalitarianism defeated only to be replaced by another? 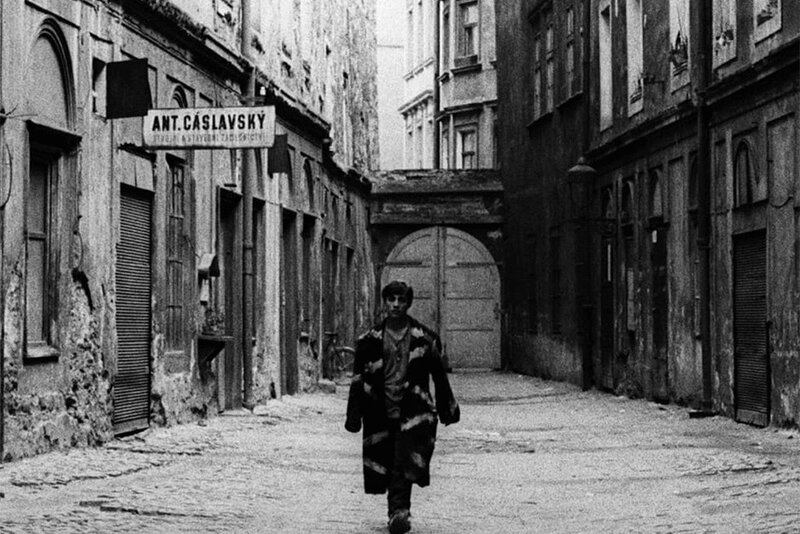 That last question, or rather its answer, haunts Eastern European cinema after the war. The heroic war against fascism was a safe, even preferred topic for filmmakers from the point of view of government censors, yet the irony of this topic lies in the way it presents itself as veiled contemporary comment. The most dramatic example of this, to my knowledge, is Zbyněk Brynych's The Fifth Horseman Is Fear (1965), which takes place during WWII yet makes no effort to look like anything other than modern Prague. Němec takes virtually the same approach, and therefore he abstracts and generalizes a highly specific incident in which two presumably Jewish boys become everymen, or everyboys. Němec's first collaboration with Lustig was the short film A Loaf of Bread (1960), also based on a true incident in the author's life in a concentration camp. That short film's debt to A Man Escaped even extends to the final burst of Bach on the soundtrack. 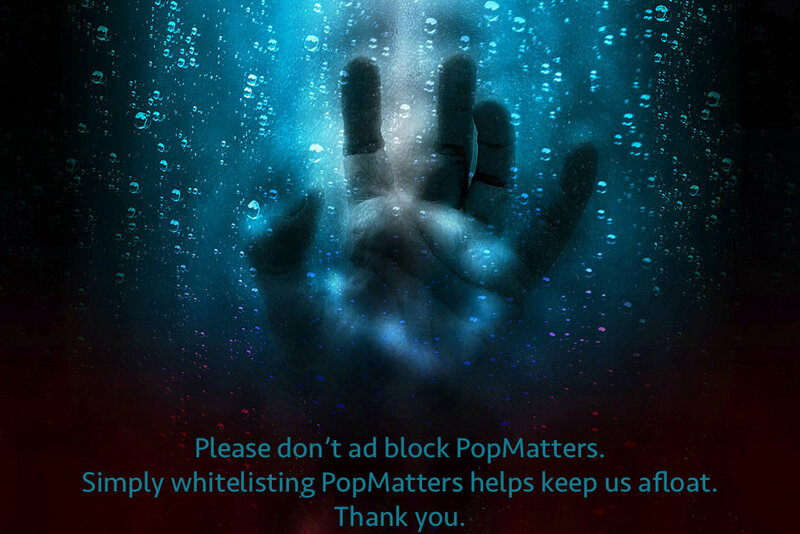 It won international awards and established his fame and context for making this feature. Also included is the filmmaker's final collaboration with Lustig, a short video documentary called Arnošt Lustig Through the Eyes of Jan Němec (1993), made for Czech TV. This dates from Němec's final flowering of film and video work when, after having done nothing in film for over 20 years (except wedding videos), he returned from the US to the Czech Republic after the fall of communism and began a flurry of production that's still under-viewed and under-available. Let's correct that please, Powers That Be in the world of DVD. As mentioned, other extras include Němec's highly informative interview on a 2009 TV program, in which he explains that he cast Antonín Kumbera as his main boy after having seen a shot of him in a railroad documentary by Evald Schorm (and where the heck are his movies?) in which a snowflake melted on his face. The other boy, Ladislav Jánský, was a photographer who later worked on Hustler magazine -- whose publisher, Larry Flynt, was the subject of a biopic by -- wait for it -- Miloš Forman (The People vs. Larry Flynt). You couldn't make this up. Němec also explains why dolly shots were officially condemned as decadent bourgeois propaganda because they equalized everything instead of singling out the most valuable things. It was a dictum poorly absorbed by Eastern European filmmakers, who are responsible for some of the most glorious tracking shots in cinema from Mikhail Kalatozov to Tarkovsky, and the most vigorously immersive historical films whose elaborate handheld work refuses to keep the audience at a distance. But we digress. Other bonuses include an interview with critic Irena Kovarova, who makes a point of stressing why she speaks of the "Czechoslovak New Wave" instead of the short-hand "Czech New Wave". The many film references and posters are a salutary reminder that this New Wave, which was under way for several years before the "Czech Spring" was crushed by Soviet invasion and crackdown in 1968, yielded a much richer array of films than the relative handful readily available to film buffs today, and that so much remains to be brought into the digital light. For that matter, some films of the pre-New Wave also remain to be rediscovered, and Němec mentions a couple of them among the national films he generally despised. He singles out Vaclav Krska, apparently a homosexual director of personal melodramas whom he compares in a manner to Antonioni, and he admires Krska for somehow being able to make movies that didn't discuss the workers' revolution. O brave old world, that has such movies in it! Where are they?